Home › Christian Politicians › Make that leap, Bill Maher. Make that leap, Bill Maher. Bill Maher makes me laugh. And cry. His radical simplification of complex issues is both laugh-out-loud funny — and gross. He pierces through the gullibility of people who let themselves be instruments of the self-interest of the rich and powerful even as they themselves become the victims of those who peddle patriotism like snake oil. In calling to account these faux leaders, Maher uses the words we would not dare use ourselves–except perhaps when talking back to the TV in the privacy of our living rooms. Maher announced his inability to handle religion in his 2008 film “Religulous.” He chose to take his camera to worshippers at truck stop chapels and theme parks,for example, rather than engage scholars of faith. Perhaps he knew they would have given him more than can be dismissed with his trademark condescension? So I should not have been surprised to hear him riff on faith at Austin City Limits last month. I hoped he might have grown since the film was made. No such luck. He confuses the need to hold deeply flawed religious institutions and leaders accountable with his inability to fathom what personal faith is about. The Tea Party IS simple. We should lament the near death of true conservatism and the retreat of its leaders. Faith on the other hand is not simple. We should lament the near extinction of thoughtful discussion about faith in the civic square and its replacement by a conspicuous religiosity unmoored from what faith teaches us about loving your neighbor—or at the very least NOT going out of your way to hurt him. 1. Why is faith so important: what is so good about suspending critical thinking? Maher’s questions are to faith what Sarah Palin’s “death panels” were to health-care: a distortion of the subject. I don’t expect a critique of Proofs for God from Bill Maher. Or for him to find God tomorrow. But I do expect a man who oozes condescension to know that faith is not the suspension of critical thinking. I do expect him to know that people of exceptional intelligence, not just the gullible masses, choose to pursue a faith journey. Smart, thoughtful people engage in years of critical thinking, prayer and meditation to discover meaning in life and to connect to the transcendent. And they aren’t all doing it through Ernest Angley or Joel Osteen. Faith is a lifelong struggle with our imagination and our heritage and our values and our yearnings and our skepticism and our doubts and our fears and our intuitive sense of the ineffable and the sacred. And it is a giant leap. And from giant leaps come the beauty of dance and song, scientific discovery and spiritual enlightenment. From giant leaps come the gifts of great, inexplicable sacrifice for the good of others, service to those in need and intimations of glory in the flower. It is the giant leap that takes us into the unknown. We can only dream of heaven. But any life beyond the one we have here on earth is unknown except through our acts of kindness towards each other. And those acts of kindness often spring from a deeply held faith in something larger than ourselves. Gardner could have been talking about faith. I’d like to say to Bill Maher, he who professes no time or patience for enduring relationships: learn to love. It’s a leap –but as anyone who has loved deeply will tell you: you will see God. Dawn, you are my newest favorite theologian! I will be quoting your lovely paragraph (“Faith is a lifelong struggle…”) and sharing it with the management team where I work in our weekly meeting. Faith requires magical thinking or at least cognitive dissonance. It’s the conflict between what we know that is based on facts and what we want to believe that has no basis in fact. Faith is “a struggle” because we are rational beings a CD makes our higher brain centers hurt. Here’s an example. Scientific evidence of many kinds says the earth that supports life is hundreds of millions of years old. Based on the Bible, some people say the earth is a few thousand years old. The first is a conclusion supported by innumerable facts. The latter is magical thinking. Ouch! I strongly support your article. 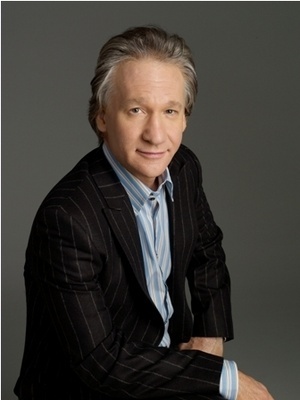 The thinking and response to Bill Maher should be posted in Huffington Post in the Religion section! I strongly feel that a journey of faith in one’s lifetime is far more critical than Bill is taking jibes at. Making fun of religion is as old as lawyer jokes and trying to enjoy a meal with a dentist…just too easy to find the obvious. A journey of making fun of things means that we might be resigned to a handful of lucky choices unless we decide to purposefully step out of our comfort zones or uncomfortable zones and say “no more” to that past of “auto pilot” thinking and feeling. The maturity that goes with folks who have actually embraced the concepts of let go and letting God assumes a paradoxical way of juggling logic with belief. Nothing comes of doing nothing but reworking the same old arguments. I would challenge Bill Maher to see how his humor at times is the way to hold up complex ideas and let us go “aha!” and sometimes humor is a way to open a door, not close it. let me see if I have this right? A giant leap is discovery of dance which you can experience with the senses is in the same catagory as a giant leap of immagination which is totally made up. That is an argument that is an insult to actual inteligence. His whole argument is trying to describe an object by that object which, using science, can not be done. Objects can only be described by relating to other objects. But Gardner wasn’t talking about faith, he was talking about meaning in one’s life and that includes meaning without faith. Too, I have truly “loved deeply” in my life and have not seen God! Please don’t speak for me. Lastly, your article did not come close to addressing Bill Maher’s 3 questions. I came away only being more convinced how right Bill is. Here is another thought. His whole argument is: you have to really want to believe before you can believe. I would question: Why do you want to? But I know the answer. Because I am insecure so, I need to make something up that will give me comfort. I say getting a soft blanket and sucking your thumb is easier. Remember, Bill Maher is a comedian who specializes in “politically incorrect” humor, satire, and parody. When he finds a topic that is somewhat “sacred” be it social mores, politics or religion, he holds it up and asks us to look at it and exercise some critical thinking. All that in support of getting a laugh, and a big paycheck. The best response to his 1st question would be faith is what it is. No apology. Just admit is belief with no real proof. Maybe you had an experience that informed your faith. maybe it was just how you were raised. It in any case, just own it – faith is essentially magical thinking. Question #2 is is actually a corollary to #1. We “know” because we have faith even though we may have doubts (thanks Mother Teresa). Pointing to your special book isn’t proof. The numbers of like minded people isn’t either. OK. It’s a tautology but it seems to give a lot of people comfort. Question #3 is more problematic. If most of the so-called “prophets” are legitimate, God really does need a new selection process. So many are shown to be sinners, con men, or just plain “nut jobs” as bill opines. I find it the height of hubris that any person can claim to know the mind of God, claim to have spoken with or heard directly from God, or claim to know The Secret Of Life, The Universe, and Everything. SO well said, Bill, you obviously use critical thinking!